What could you find right in the middle of a raging storm? and maybe even that pair of missing glasses. But beware, because you might step into a video game battle or the Revolutionary War. Watch out for assassin sharks, trees with monster arms, cars colliding with screeches and shrieks, and that hamster as dangerous as a crocodile. And donâ€™t forget to enjoy the colorful unicorns and show respect to the grass! 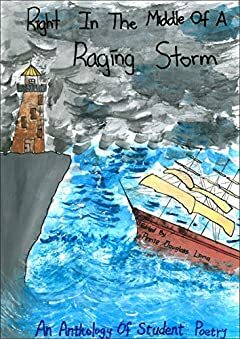 Created by fifth-grade students, Right in the Middle of a Raging Storm features poetry in a variety of styles, from free verse to diamond poetry, acrostics, and haiku. Proceeds from the sale of this anthology will benefit Lumos, a UK-based nonprofit organization dedicated to placing institutionalized children in families that can provide individualized, loving care. Learn more at https://wearelumos.org/.